The rules regarding wills and trusts developed over the course of centuries by English judges were later modified when American courts began developing their own common law. Under the American system, the regulation of wills and trusts is a matter left to the authority of the individual states. In North Carolina, Chapter 31 of the General Statutes governs wills and Chapter 36C governs trusts, with some related matters covered by other sections. Under Chapter 31 of the North Carolina General Statutes, any adult person of sound mind may make a will. This will may be in attested written form or may be "holographic," which means it appears in the handwriting of the testator. 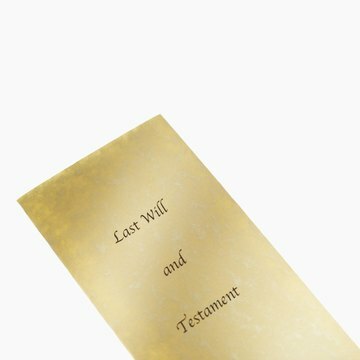 Holographic wills must bear the testator's signature and must be found among his valuable papers or on deposit with some authority for safekeeping. Wills in North Carolina can also be "nuncupative," or oral. A valid nuncupative will must be made on the testator's deathbed and witnessed by at least two individuals whom the testator specifically requests bear witness to his last wishes. A testator may revoke a written will only in writing or by destroying it with the intent of revocation. While there is no requirement that a holographic will be witnessed, written wills in anything other than the testator's own handwriting must bear the signatures of two witnesses who actually watch the testator sign the will. Any person competent under state law to testify at a trial may witness the execution of a will. A beneficiary may serve as a witness, but there must be at least two other disinterested witnesses or the will shall be void as to his interest. Under Chapter 36C of the North Carolina General Statutes, trusts can be created by a court, by a written trust document, in a will or by a declaration by the owner of property that he holds property in trust for another. In order for a trust to be created, a settlor must be competent to convey property in trust and indicate an intention to create a trust. The trust must have an identifiable beneficiary and duties for the trustee to perform. While a trustee can also be a beneficiary, a sole trustee cannot be a sole beneficiary. A trust that would otherwise be irrevocable may be terminated if it becomes impossible to administer the trust as intended or the trust can no longer be operated in compliance with North Carolina law. A court can modify a charitable trust to further the original charitable intent or bring the trust into compliance with the law to enable it to continue. A revocable trust can be revoked by any method specified in the trust document, by written revocation or by executing a later will or codicil that specifically references the trust or specifically gives away property that otherwise would have passed under the trust. North Carolina General Statutes Sec. 31-3.4: Holographic Will. North Carolina General Statutes Sec. 31-3.5: Nuncupative Will. North Carolina General Statutes Sec. 31-5.1: Revocation of Written Will. North Carolina General Statutes Sec. 31-8.1: Who May Witness. North Carolina General Statutes Sec. 36C-4-401: Methods of Creating Trust. North Carolina General Statutes Sec. 36C-4-402: Requirements For Creation. North Carolina General Statutes Sec. 36C-4-413: Cy Pres. North Carolina General Statutes Sec. 36C-6-602: Revocation or Amendment of Revocable Trust. A trust is an estate planning document that transfers property of the trust's creator, known as the “settlor,” to the trustee for the benefit of a beneficiary named in the trust document. A trust is considered a living trust when it is created and takes effect during the settlor’s lifetime. A living trust can either be revocable or irrevocable. In a revocable living trust, the settlor can amend or revoke the trust anytime during his lifetime. In Indiana, the trustee's duties are set forth in the Indiana Trust Code. The steps for trust modification are generally the same regardless of whether you are creating new terms for the trust or reinstating prior provisions. The process of modifying a trust hinges on the type of trust it is and who wants to amend the terms. Depending on the circumstances, the creator of the trust, parties to the trust, or a local court can reinstate the prior provisions. The laws regarding a trust vary based on the state where the trust is located, although 23 states have adopted the Uniform Trust Code. If you wish to modify a trust, consider reviewing your state’s laws or consulting with an attorney. Can a Husband Claim Rights to Your Trust Fund in Divorce? A trust fund is a legal entity created by the grantor for the financial benefit of another person, the beneficiary. The grantor funds the trust by placing assets in the trust's name. He also names a trustee who is responsible for overseeing the trust and distributing trust assets to the beneficiary according to the trust's terms. Generally, a spouse cannot claim rights to your trust fund in a divorce, but courts in some states have awarded trust fund assets to the non-beneficiary spouse under certain circumstances. Can a Living Trust Be Disputed?